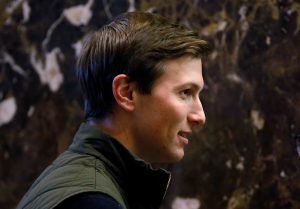 NEW YORK — Jared Kushner, President-elect Donald Trump’s son-in-law and one of his closest advisers, is taking steps to distance himself from his sprawling New York real estate business in what is the clearest sign yet he is planning to take a position in the new administration. Kushner, who is married to Trump’s daughter Ivanka, must clear a series of hurdles before he takes any post in Washington. He will need to argue that a federal anti-nepotism law that bar officials from appointing relatives to government positions does not apply to him as well as eliminate potential conflicts of interest between his family’s multi-billion dollar real estate empire and his government duties. Kushner, who often has the last word with the president-elect before a major decision is made, has explored stepping away from his role as CEO of the real estate business and has consulted with federal officials about resolving potential conflicts, according to his lawyer. Kushner’s challenges highlight a notable pattern of the incoming administration. While some government officials will be forced to divest and rearrange their financial portfolios to comply with federal ethics laws, their boss will not be required to do the same. As president, Trump is exempt from laws aimed at ensuring federal employees’ personal financial interests do not influence their decisions. The president-elect has said he intends to distance himself from his own international real estate business, but he has suggested he intends to break from precedent by retaining a stake in the company. Trump is expected to announce some plans for his business during a Wednesday news conference. The Kushner Companies is a major real estate investor in New York and elsewhere and participated in roughly $7 billion in acquisitions in the last decade. If Kushner joined the administration, he would divest some of business interests, including his stake in a major Fifth Avenue skyscraper, according to his spokeswoman Risa Heller. Kushner has spent months negotiating a redevelopment of that building with Anbang Insurance Group, a real estate giant with close ties to the Chinese government, The New York Times reported on Saturday. In addition to working through that nest of potential conflicts, Kushner has also been consulting lawyers about a federal anti-nepotism law that bars officials from appointing relatives to government positions. The 1967 law, which was seen as a response to President John Kennedy selecting his brother Robert Kennedy as attorney general, would also be a potential obstacle for Ivanka Trump, who is also expected to have a role in her father’s White House. Some Trump advisers have argued that the law does not apply to the White House, only Cabinet agencies. As precedent, some Trump backers have pointed to the woman the president-elect defeated in last year’s bitter White House race: Hillary Clinton. President Bill Clinton’s decision to put his wife in charge of his health care reform efforts was challenged in court, but two federal appeals judges said the anti-nepotism law did not appear to cover White House staff appointments. But if Trump finds White House roles for his daughter and son-in-law, he’s walking an ethical tightrope that could set a precedent for future presidents, said Norm Eisen, who served as President Barack Obama’s chief ethics counselor. For example, if the first lady’s office essentially becomes the first family’s office, “it will be like institutionalizing nepotism,” he said. “And I think it could be politically perilous.” At the least, Eisen said, Trump should ensure the couple is categorized as regular government employees who must routinely publicly file disclosures about their business ties and investments. In the campaign’s stretch, Kushner was a constant presence at his father-in-law’s side. He has acted as a gatekeeper to Trump in the transition and has sat in on scores of high-level meetings, including Cabinet interviews. If he takes a government post, his presence in the West Wing would add another power center in a White House that is shaping up to be top heavy. Incoming chief of staff Reince Priebus and senior adviser Steve Bannon were announced as “equals.” Conway, who will serve as counselor to the president, is also likely to have autonomy and direct access to Trump. Ivanka Trump has taken steps to leave her role at the Trump Organization, which the president-elect said would be run by company executives and his two adult sons, Don Jr. and Eric. In a brief interview Friday with The Associated Press, Trump said he has a “very simple solution” for addressing his business ties, but would not detail the plans. He also suggested the matter was not important to Americans. Pace reported from Washington. Julie Bykowicz contributed reporting from Washington.